Is there a tradition for portraying light in triangles? Artists only employ principles if they function well in their artworks. I mention this as no matter how interesting a principle is in theory, the principle is only useful if it works in practice. In the following discussion I will address two ways that early artists have portrayed light in triangles for very practical purposes. The first of these approaches is the well-worn phrase, “Rembrandt’s triangle of light,” popularised by advice given to budding portrait photographers. This approach to using light in a triangle involves physically lighting a sitter so that a triangle of light is created below the eye on the shadow side of the face. Purportedly, the term evolved from a comment that Cecil B. DeMille made to Sam Goldwyn concerning Rembrandt’s lighting of his subjects, but the idea has recently taken on a life of its own. 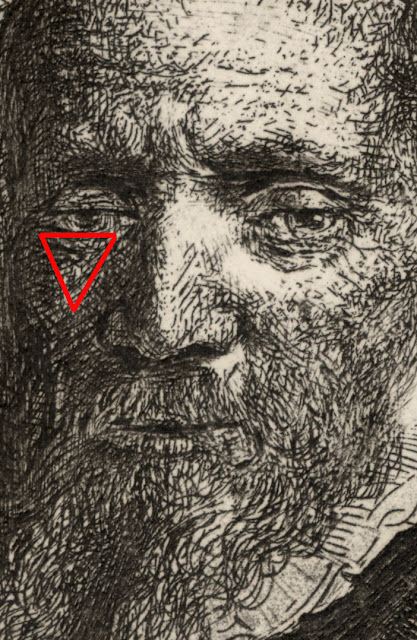 The evolution of this triangle has now been codified with exact proportions: the triangle should not be longer than the length of the sitter’s nose and it should be no wider than the length of an eye. 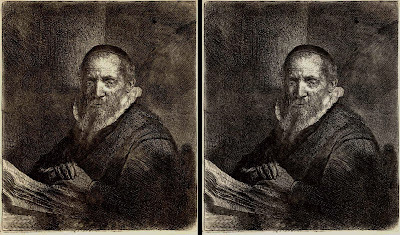 Moreover, the positions of where the photographer’s key and fill lights should be arranged have also been formulised (for a summary see http://en.wikipedia.org/wiki/Rembrandt_lighting). There can be little point in arguing whether this special angle of lighting creating the triangle of light on a sitter’s face really functions. One only has to look at Rembrandt’s paintings, drawings and prints featuring this lighting pattern to see the psychological dimension that the triangle adds. Of course, Rembrandt was not enslaved to the formulaic “triangle of light” promulgated with his name. Take for instance the subtle tonalities of his etching of Jan Cornelius Sylvius, Preacher (shown below). Here a smaller than usual triangle of light illuminates the shadow side of the preacher’s face (see details further below) but the size of the triangle is all that is needed to reveal his right eye attentively engaged with looking at the viewer. Condition: The print is cut on the plate mark (as published by McCreedy). It is in very good condition and is not pasted down. 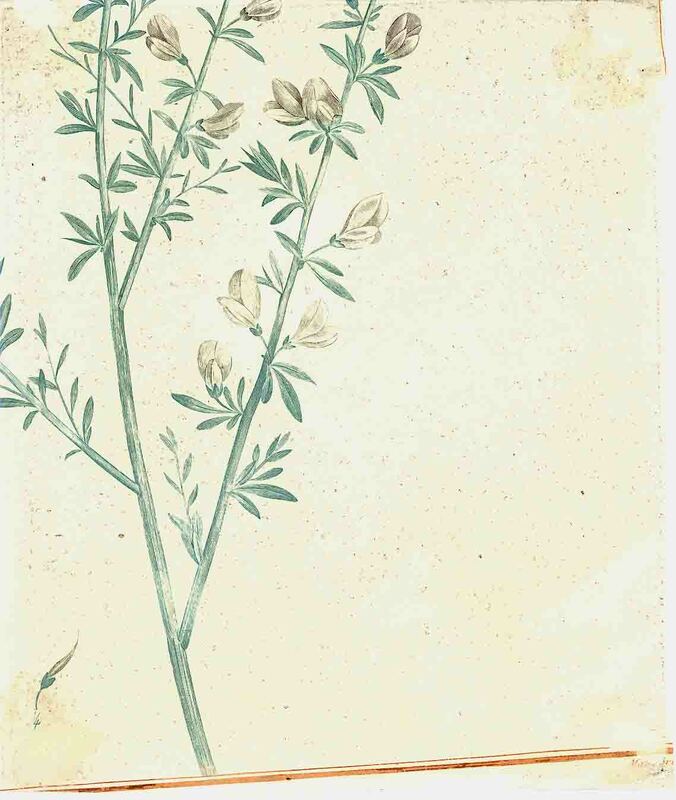 The back of the print features a section of a botanical engraving from the 1784 edition of Stirpes Novae (see image below). The trimming of prints and the printing on the verso pages from Stirpes Novae for the 200 Etchings folio is discussed by Lino Mannocci (1988) in The Etching of claude Lorrain (p. 28) and by H. Diane Russell (1982) in Claude Lorrain 1600–1692 (p. 300). I am selling this print for $670 AUD including postage and handling to anywhere in the world. Please contact me using the email link at the top of the page if you are interested or click the “Buy Now” button. Red lines delineate "Rembrandt's Triangle of Light"
Compare, for example, how the whole notion of attentive engagement changes if the triangle is increased to the proportions approximating those advised for photographers (as shown below and I apologise in advance for the audacity to digitally alter Rembrandt’s image.) 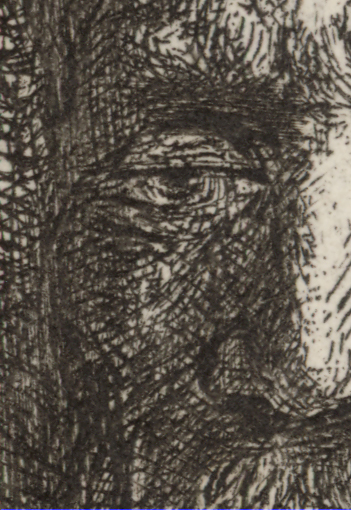 The ability for a viewer to read the contours of the face may have improved with the increase in size of the “triangle of light” but the effect is "studied." 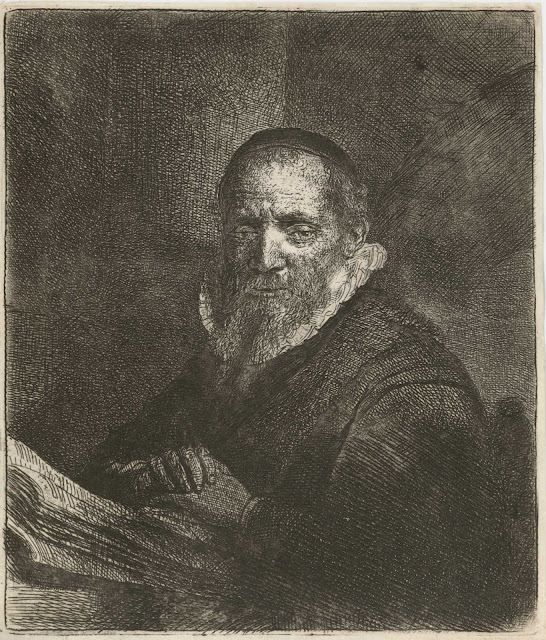 The preacher now appears frozen in time, caught in an endless moment, rather than at the specific instant of looking up from his reading to the viewer. Of course, no matter how much rationalising of an image is proposed, ultimately, the reader alone must decide which of the two images is the more expressive. Although the practice of creating an inverted triangle of light under the shadow eye serves a clear function in projecting a sitter’s psychological mindset, Rembrandt does not always apply this visual device. 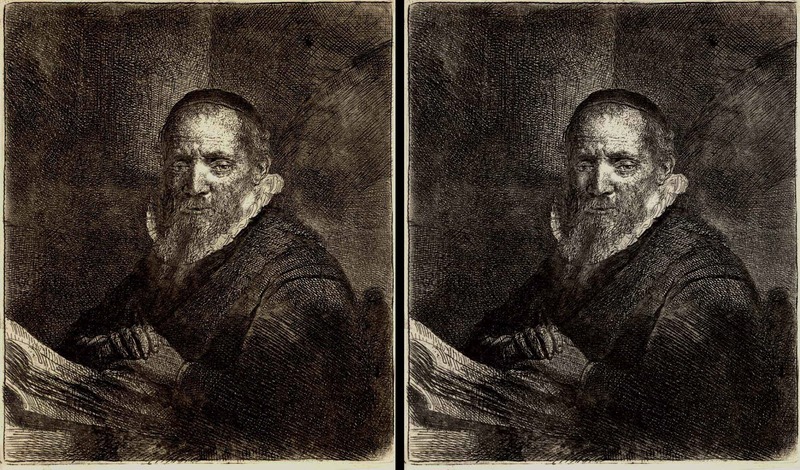 For example, there is no triangle of light in his etchings: Rembrandt in Soft Hat and embroidered Cloak (Bartsch 50.7-IV [X]) or in Rembrandt in Cap and Scarf, Face in Shadow (Bartsch 50.17-III [II]). In short Rembrandt employs this triangle of light when it suits his purpose and as such the device is merely a useful principle rather than an obligation. This is also true for other artists as well. 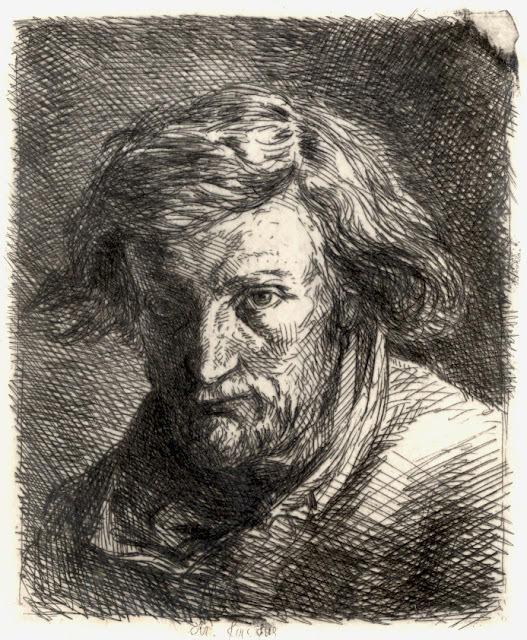 In Charles-Émile Jacque’s Self Portrait (shown below) for example, a strong directional light spotlights the artist’s face, but an inverted triangle of light is not visible on his shadow side. The reason or perhaps the multi-layers of reasons for his choice to portray himself in this way can only be conjecture. What is clear, however, is that Jacque wished his portrait to be seen as theatrically dramatic. Going further, he sought to align his use of lighting with the convention of chiaroscuro lighting handed down from the Baroque period. Condition: Very strong impression in excellent condition with the identifying foul-bitten area at top-right. 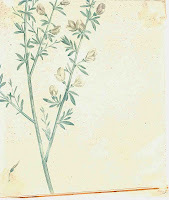 The etching is presented like a chine colle print but is actually supported on window-cut cream wove paper. There is an early pencil inscription listing the print details at the bottom edge of the support sheet. An example of Bercham’s triangle may be seen in his etching, Three Hunting Dogs, addressed in the earlier post focused on the Inverse-Square Law. 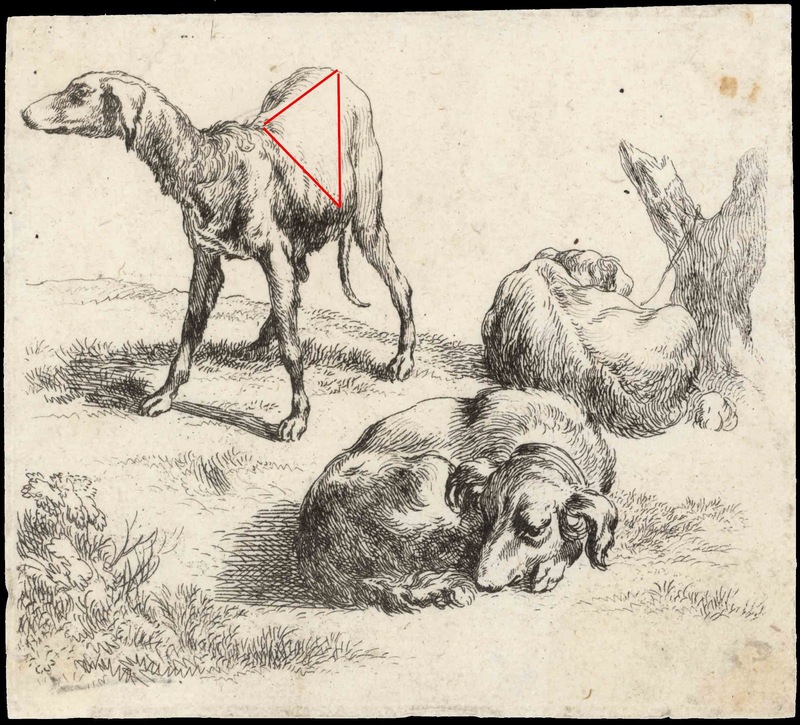 In that discussion the standing dog in the print was described to be “rendered with the strongest contrast.” If I may elaborate on this previous discussion even more, I wish to draw attention to the triangular shape of light falling on the dog’s torso (see diagram below) and suggest that this shape gives pictorial expression to the light’s intensity. Red lines delineate "Berchem's Triangle of Light"
Berchem’s triangle does more than signify an area of intense light in the print. The shape is also a pivotal point in the composition; one that simultaneously catches the eye’s attention and creates a centre of interest. 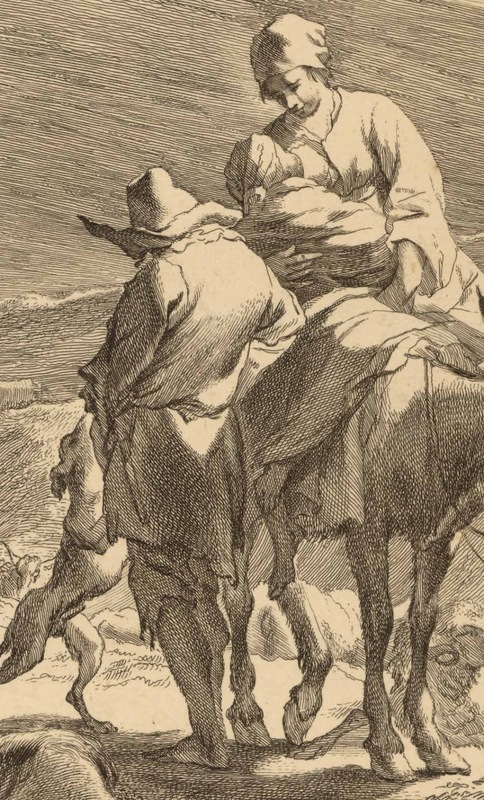 Cornelis Visscher’s etching of Berchem’s Mother with a Child on a Donkey (shown below) involves a more complicated arrangement of this principle. Here, a triangulated visual dialogue is created. First, there is a link between a triangle of light on the torso of a distant urinating horse and two abutting triangles forming a diamond shape of light on the back of a shepherd. 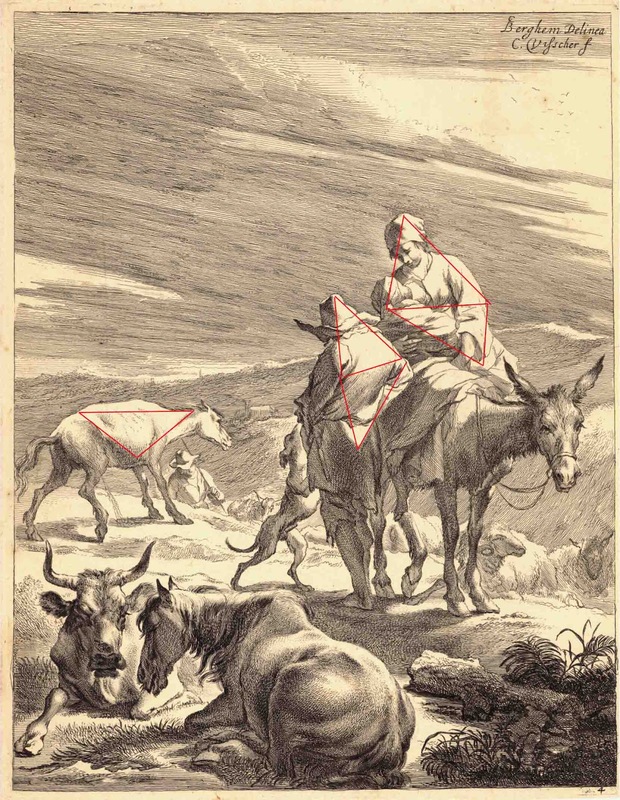 There is another and much more intimate link between the diamond shape on the back of the shepherd and another diamond shape formed by two abutting triangles of light illuminating the shepherd’s wife cradling her child on the back of a donkey against which he rests (see diagram further below). This three-way relationship gives scope for the viewer’s eye to engage in scanning across the image from one triangle to the next and to negotiate meanings from reflecting on these connections (i.e. the connection between the shepherd and the animals under his care and the connection between the shepherd and his family driven by the shepherd's dog raised on its hindquarters and seeking his attention). Condition: A very fine impression of the last quarter of the 17th century, in fine condition. Small margins all around; printed on laid paper; central horizontal crease; scattered very minor spotting; remains of an old mount in the corner of the reverse; very light surface soiling. Red lines delineate "Berchem's Triangles of Light"